Russian political analyst and journalist. 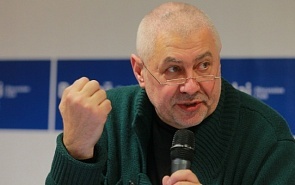 Previous positions: Head of the Effective Politics Foundation; Editor-in-chief and Publisher of the Russian Journal and the Pushkin Magazine; President of the Russian Institute; Member of the Public Chamber of the Russian Federation; Professor at the National Research University – Higher School of Economics. Return of the Refuseniks: Is Political Emigration Back in Russia? We're not talking about how many liberal-minded people have emigrated so far, but rather about the fact that there are no prospects of a legitimate liberal force taking shape in Russia. So emigration, in whatever form, becomes a private affair rather than a political issue. Russian emigres based in the West easily integrate into local communities, and stop having any tangible influence on Russia. Nobody has called Alexei Navalny a strong politician as of yet. He is an interesting public figure and sometimes implements very successful initiatives. He made a successful attack on United Russia that became rather famous because he timed the attack with the weakening of the government. However, he became indecisive and largely lost his advantageous position each time after achieving success in such attacks. Totalitarianism in the USSR was unique because it was limited by its own declared principles. People had no reason to be afraid of the police. The atmosphere was entirely different than today. But this society recoiled from its own self and repudiated the goal besmirched by the crimes of the Stalinist period and the stagnation of the Brezhnev era. Now we have a society that does not have any goals. The protest movement needs to radically change its tactics, by focusing on the elections and election monitoring missions, which in itself are a great resource. Obviously, this new tactic will drive away some of the activists in Moscow, but in general the public has already been energized. At this stage the opposition needs to focus on long-term efforts to create structures in the regions. Dmitry Medvedev refused to run for reelection, which is reason to consider his rule from a psychological, rather than political angle. Outgoing Moscow Region Governor Boris Gromov’s resignation was predictable. The federal government no longer views the development of the Moscow Region as a separate process; Moscow and the Moscow Region are seen as an integrated entity and they are going to be restructured as one.